Rich, vibrant color. Real black. You don’t realize how much you’ve missed them until they pop up again, as they do on Lenovo’s new X1 Yoga. I can’t overstate just how much nicer its OLED display looks compared to the cold LCD screens we’ve grown accustomed to. The images Lenovo sent us don’t come close to doing it justice, so you’ll have to trust us—or take a look yourself at a live unit. The vehicle for this excellent technology, the X1 Yoga, is a riff on the X1 Carbon, and it sports several notable improvements. It has an active pen/stylus on board, a larger array of ports, and you can fully rotate the display to use the laptop in orientations from tablet to tent to traditional clamshell. Lenovo refers to all this as being Yoga-ized, which definitely sounds more appealing than a Yoga being carbonized. The X1 Yoga in tent mode, with an invisible hand using the stylus to input text. If you’re familiar with the Carbon and Yoga series, or Lenovo in general, the X1 Yoga’s won’t surprise you. It comes dressed in black, with the usual hints of red on the eraserhead cursor control and the top set of touchpad buttons. Splashes of silver distinguish the display hinges and the logo. The X1 Yoga open as a normal laptop. The X1 Yoga weighs about 2.8 pounds, and measures approximately 13 x 9 x 0.66 inches. The display is that fantastic 14-inch, 2560x1440 RGB OLED that I’ve already gushed over. The fact that it’s RGB is a nice feature: It means there are no white sub-pixels used to brighten the display. You get just red, green and blue. It’s the best and most expensive type of OLED. Inside our $2,544 review model is a Intel Core i7-6600U CPU, 16GB of LPDDR3/1866MHz RAM, and a 256GB Samsung SM951 PCIe-NVMe SSD. An Intel 8260 wireless card provides 802.11ac Wi-Fi and Bluetooth 4.1. The port selection is probably the only area of disappointment with the X1 Yoga. It does have three USB 3.0 ports (one always-on for charging), full-sized HDMI, mini DisplayPort 1.3, microSD and SIM slots on the back, plus Lenovo’s OneLink+ docking connector. But we were also hoping to see USB 3.1 (either Type A or Type C) or Thunderbolt. These modern additions would’ve taken the X1 Yoga from fantastic to awesome. 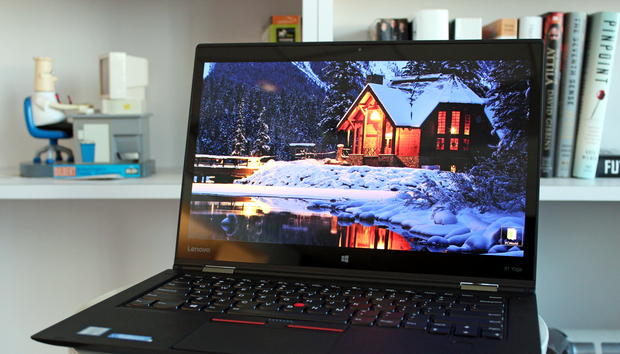 The X1 Yoga’s keyboard, clickpad, and Trackpoint run smoothly. Very smoothly. And overhead shot of the X1 Yoga’s fantastic sculpted-key keyboard. Despite the short amount of travel in its sculpted keys, the keyboard feels fantastic to type on. Each key press delivers a firm, decisive finish, as does the clickpad, and the latter's surface feels velvety when you slide your fingers across it. The X1 Yoga performed about as we expected for a machine with its specs and slim profile. In short CPU-based tasks, like our Cinebench R15 benchmark, its Core i7-6600U part can give a small boost in performance over Core i5 parts. Its score of 299 marks a roughly 3-percent gain over ultraportables with a Core i5-6200U processor (currently one of the more common parts in ultrabooks). That said, the Surface Book still manages to hold its own running a Core i5-6300U CPU. The thinner the machine, the more challenging it is to keep the processor cool—particularly if fan noise is a concern. Many thin laptops stay quiet by throttling CPU performance under heavy prolonged use, and our Handbrake test tells the tale. This benchmark, which involves converting a 30GB MKV into a MP4 on the Android Tablet preset, is a torture test for ultraportable systems like the X1 Yoga. Lenovo’s OLED beauty dropped from a clock speed of 3.18GHz to a steady 2.78GHz after core temperatures rose and stayed at 72°C for several minutes. Still, it didn’t throttle as heavily as some systems with even greater thermal constraints (like the LG Gram 15) do—it still performed roughly in the same range as the Dell XPS 13 and HP Spectre 13.3. Of course, the X1 Yoga isn’t what you buy for content creation. Most people in the market for a thin-and-light just want to surf the web or watch a movie. In our PCMark8 Work Conventional benchmark, which simulates simple office work—document creation and editing, web browsing, and video conferencing—the X1 Yoga scored 2,685. That’s actually slightly lower than some Core i5 systems, like the XPS 13, but in actual use, most people won’t notice much of a difference when writing an email, adding some basic data to a spreadsheet, or browsing a website for office supplies. In fact, what influences how fast a system will subjectively feel is more so the type of storage drive. Happily, the X1 Yoga comes equipped with the fastest you can currently get: a PCIe-NVMe SSD—but the experience puzzled us at first. Windows and applications didn’t pop open the way they should with an NVMe SSD. For some reason, Lenovo didn’t install Samsung’s NVMe driver, instead relying on Microsoft’s. As a result, the SSD read great, but wrote like an inebriated hog. Before and after installing Samsung’s NVMe driver on the X1 Yoga. Note that the 4K writes (unthreaded) were so slow before the install, they don’t even tick the chart. Installing the proper driver (downloaded from Samsung’s website) worked miracles. The feel of the unit perked up dramatically, as you can see in the AS SSD benchmark results above. If you see reviews complaining that the X1 Yoga doesn’t feel as fast as it should, the generic driver is probably why. As for gaming performance, the X1 Yoga performed about equal to its ultraportable peers in 3DMark’s Cloud Gate test. That said, the whole lot of ultrabooks can’t do much to begin with on their integrated GPUs. At best, you can play games with light system demands. Of more importance for a machine like this is battery life. The X1 Yoga’s 56-watt-hour battery lasted 7 hours and 44 minutes during our video playback test, in which we played a 4K movie file on continuous loop in Windows 10’s Movie & TV app with the screen brightness set between 250 and 260 nits. That’s about a transatlantic flight. One note, though: In order to get that screen to 250 nits, we had to crank the brightness up all the way to 100 percent. Strangely, though, the panel’s OLED nature seems subjectively brighter at 250 nits compared to other machines set to the same level. That’s possibly due to the fact that the display type seems to induce a bit of a home-brew HDR effect even in standard-definition material. OLED screens already possess that kind of dynamic range, thanks to the rich black they render. Fire, laser shots, and such really pop compared to the same type of elements on an LCD display. Without a doubt, OLED makes just about everything more compelling (especially movies), at least visually. Sadly, it can’t do anything for poor writing, directing, or acting. The X1 Yoga starts at $1,549 with an IPS LED backlit LCD touchscreen, and tops out at a little over $2,500. The cheapest OLED version—and you want the OLED—is $1,869. That comes equipped with Windows 10 Home, a Core i5-6200U processor, 8GB of LPDDR3/1866MHz RAM, and a 128GB SATA SSD. Our configuration, which has Windows 10 Pro, an upgraded CPU, additional RAM, and a larger (and faster) storage drive, jacks up the price to $2,544 as mentioned above. You can opt for a 512GB SATA, 512GB PCIe-NVMe, or 1TB PCIe-NVMe SSD instead, but prepare to shell out up to another $250 more. As of press time, Lenovo was offering a discount on these list prices—our review configuration cost $2,289.60—but you can save money in other ways, too. For example, you could easily cut the amount of RAM down to 8GB, and opt for a Core i5 CPU. If you’re not crunching lots of numbers or editing high-def media, you won’t notice the difference between the processors much, particularly since you’ll be keeping that NVMe SSD. Fast storage will have far more of an effect on perceived performance than the CPU. You could also downgrade to Windows 10 Home and save $30, but I’d advise against that. The Pro version allows you to ditch some intrusive stuff using the group policy editor, and also brings the ability to join a domain and other perks. Our configuration shipped with relatively little software clutter, but Lenovo does tend to brand things, so a little time culling the app herd won’t hurt. One included utility that we’d never call clutter is WRITEit, which lets you enter and edit text in any application with the active stylus. It even does a good job with my handwriting, which is some of the ugliest ever to disgrace a page. The X1 Yoga comes with a one-year, carry-in warranty. Adding a single year to the standard warranty is $69, with each additional year about $50. Other warranty/service packages are available, too, with the most expensive package offering five years of next business day on-site service and accidental damage coverage for $649.